"I live in Phoenix and all the legal Hispanics I know are in full support of this bill. One of them told me last night he was at the capital protesting the protesters. The media wanted nothing to do with him." "I too know many Hispanics that are tired of tolerating the illegals. They have run down their neighborhoods and then get lumped in with the aliens. Pisses them off." "I have elderly family members that live in the Sonoran desert in Arizona. Sometimes during the day they have to retreat into their home because the illegals run thru the arroyo in back of their house, stealing the fruit from their trees on their way up from the border. My relatives feel they are under seige. Places where they used to go and shop and have dinner are now off limits to them. Their world is getting smaller. It is to our everlasting shame that Janet Napolitano, director of Homeland Security and former Governor of Arizona has not been tarred and feathered by now." "I know some recent legal immigrants who are proud of the work they went through to become citizens. They learned our language, they studied our system of government, they took the test and passed, and they DO NOT WANT amnesty for those who won't go to the back of the line and make the same effort they did. I welcome our new citizens, like this babe woman." In fact, a recent Quinnipiac poll of voters found a majority of tea party supporters—55%—are women. To put that in perspective, only 48% of women voted for George W. Bush in 2004. 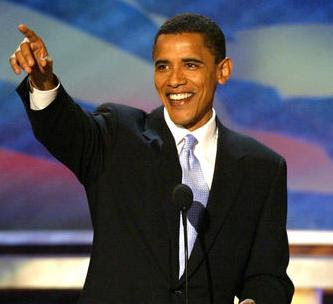 And just two years ago, President Obama won 56% of the female vote. As part of a recent book project I've been asking women around the country: Why are you angry? What is it about the tea party movement that energizes busy working moms to get even busier organizing protests? Many women gave the most obvious answer: "If we waited around for you men to do it, it would never get done." When I asked Christen Varley, the Boston tea party leader, she said it's because moms tend to be "the CEO's of our households. We do the shopping, bill paying, budgeting, etc. We know less money means less freedom. Maybe if the president and Congress did the grocery shopping, they'd know why we're mad." Keli Carender isn't a mom, but the Seattle-area 30-something is the mother of the tea party movement. She held the very first rally of the modern tea party era to protest the so-called stimulus package, days before Rick Santelli's infamous CNBC rant. The tea party idea "just clicked in the minds of conservative women," she says. "Most women I know are thinking 'I'm taking care of my family and the government's taking care of it's business—right?' Then they see what the government is really doing and they saw 'Whoa, whoa! I guess I've gotta take care of their mess, too.'" Wally Hickel was a mover and shaker in Alaska politics of the Titan variety. He died last night at age 90. More on his life and legacy here. Hickel first became governor, as a Republican, in 1966 and, to hear him tell it, had a vision of an "ocean of oil" at the site that became the Prudhoe Bay oil field. Two year later Richard Nixon named Hickel U.S. Secretary of the Interior, then ended up firing him after Hickel told Nixon he was wrong on Vietnam. 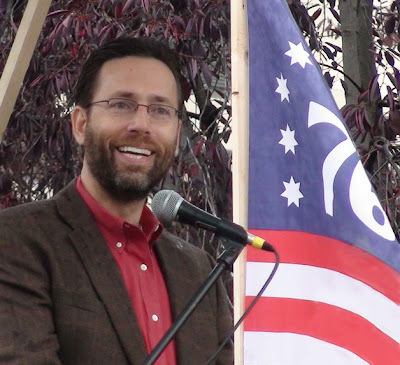 Twenty years later, he was elected to a second term as governor, this time on the Alaskan Independence Party ticket after he jumped into the race late in the campaign. 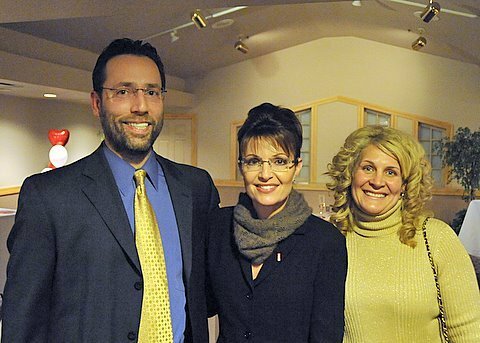 Wally supported Sarah Palin in her run for Governor. He later had a bitter split with her over the gasline issue. While he and Palin may have had strong differences in the end, Wally truly shaped the face of Alaska politics for decades, and I was fond of the old guy. "Governor Hickel was a visionary who loved this great state," Parnell said. "He taught us to dream big and to stand up for Alaska. Governor Hickel will be remembered for many things—for his wit, for telling it like it is, and for always reminding us that our resources belong to Alaskans. Sandy and I extend our deepest sympathies and condolences to Governor Hickel's family, friends, and colleagues. Alaska, and, indeed our nation, has lost a great one." Jan Brewer to the President: "Do Your Job!" USA Weekend profiles Sarah Palin for Mother's Day, and I must say, Track looks absolutely thrilled. He's like, "Yeah, could you hurry it up so I can go fishing or something." LOL! Bristol, 19, holds son Tripp, 16 months. Trig, 2, rides the rocking horse. Track, 21, was in Iraq with the Army. Piper, 9, takes ballet, jazz, tap and tumbling. Willow, 15, played football until seventh grade. 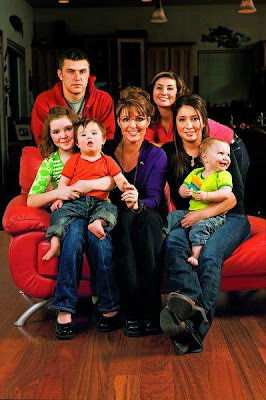 "This is the first time we’ve had all the kids together in the same picture!” exclaims an amazed Sarah Palin, flanked by her five children and baby grandson in her Alaskan home. The occasion for this Palin first: helping USA WEEKEND Magazine mark Mother’s Day 2010. Family life goes on while Palin is on TV, live from the backyard. Except for the fact that the entire brood is here, this is a typical Friday afternoon: half-clothed toddlers running around; Willow, 15, hanging out with her pink iPhone; a camera crew in the backyard; dinner getting cold; and Palin ever-ready for prime time in her curly updo, TV makeup, bell-bottom cords and clunky platform heels. 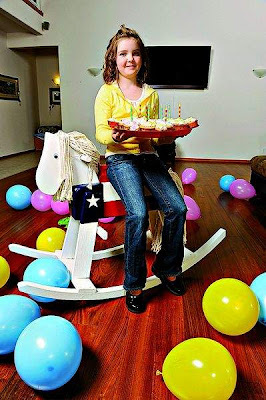 At the kitchen door: Sarah Palin and daughter Bristol tend to their toddler sons. “They’re best buds,” Bristol says. The house is a surprisingly simple A-frame that husband Todd, 45, built in 2002. About the only wall decorations — other than a magnificent view of the lake through floor-to-ceiling windows — are deer and caribou heads and a rack of moose antlers mounted above the flat-screen TV in the all-purpose living-dining-family room. So far, the one visible sign of Palin’s burgeoning income (by one estimate, at least $12 million since she resigned as Alaska’s governor 10 months ago) is a two-story office under construction with an adjoining hangar for Todd’s small plane. A driveway strewn with eight pickups and cars makes the small compound’s entrance resemble an auto-repair lot more than the home of a political superstar. Inside, the barely controlled chaos flows over a hectic household in which each member is expected to do and make do. “We do the cooking. We do the cleaning. We all do the laundry,” Palin says. In fact, Palin is busier than ever. In addition to being a Fox News contributor, an eight-part TLC TV documentary series she hosts will start filming this summer. She spends much of her time in the Lower 48, as Alaskans call the rest of the mainland U.S., campaigning for conservative causes and raking in six figures for paid appearances. She also has signed up to write a second book; her first, Going Rogue, sold 2.6 million copies last year. As she promotes a growing Palin empire, her family is held together by trim, blue-eyed Todd, a man’s man who can cradle a baby bottle as well as a hunting rifle (yes, he shot both that deer and that moose hanging on the wall). Still, “he works harder than any guy that any of us will ever know,” Palin says, shooting a smile at him a few feet away. “He gets up at 4:30, changes Trig, feeds him in the high chair,” then drives Willow to high school 14 miles away, only to come home and ferry Piper to grade school. “If I didn’t have Todd, perhaps I would be more worried” about Trig, standing, who has Down syndrome. “Todd doesn’t sleep much!” Palin says, interrupting herself and offering to make a bottle to help Bristol, a visibly exhausted and exasperated young mom. Palin opens a bottle of formula and continues to talk, while Bristol stands at the kitchen sink with Tripp, eating a taco her mom made. Only two weeks earlier, Bristol moved into her first-ever apartment in Anchorage, 45 miles away, where she works as an assistant in a dermatologist’s office. There, she is learning to cope as a single working teenage mother. Inevitably, Palin concedes, not everything in a family works out as planned. Palin goes on to tell how she and Todd learned that Bristol, then 17 and a senior in high school, was expecting a child. Bristol arrived at the house with Levi Johnston, her then-boyfriend and now very estranged father of the baby. “We knew something was wrong because Levi was in the house, and he’s not a very social kid,” Palin says. “Levi didn’t say anything. ... Bristol said, ‘Mom, what do you think is the worst thing possible that can happen in our family?’” Bristol couldn’t go on. Finally, a girlfriend of Bristol’s blurted out the news. 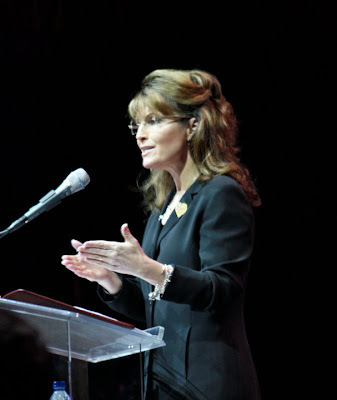 For perhaps the first time in her life, Palin says, “I was speechless. It took some time for us to get our arms around that one." On raising girls: “I don’t want them to believe they can’t do something because they’re a girl.” All three girls played football. 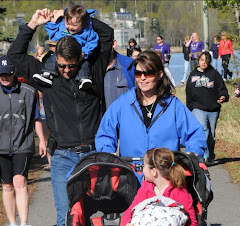 Palin makes no apologies for the impact her frenetic lifestyle and fame has had on her children. “They’re quite independent, and they’re thick-skinned,” she says proudly. “Those are some attributes that any parent would want for their kids. But for now, it’s getting late, and those birthday candles still haven’t been lit. One of the things I like so much about writing for American Thinker is the comments page. Readers offer so much: tips for books to read, quotes to ponder, spiritual inspiration. And then there are times when the comments absolutely floor me. I was shocked that readers were shocked about my previously viewing Marxism as sublime. I was astonished that readers were astonished about my young client's freak out about styrofoam. I realized that liberals really do live on another planet. Sometimes I feel like I'm having a Close Encounter of the Political Kind. Conservatives can mistakenly assume that liberals think like they do, in a learned and rational way. This is an exercise in futility since liberalism is not based on logic. To become a conservative, I've had to learn a whole new language, one based on reason. If conservatives want to understand the liberal mind, they should consider becoming bilingual too. -- The most illustrious of all leftists, Noam Chomsky, still maintains that the Khmer Rouge did not slaughter millions of Cambodians. -- Liberal luminaries, Annette Bening and Naomi Wolf, defend Radical Islam, including the dreaded burqua. -- After journeying to Cuba, members of the Congressional Black Caucus bragged about the stellar conditions there. -- Michael Moore thinks that the Cuban health system is to die for. -- Anita Dunn, a former special assistant to Obama, stated that Mao was one of the people she admired the most. If these are the more informed liberals, what about Jane and Joe in the street? -- During the primary, I asked my friend Gail why she was voting for Obama. Did she know anything about his voting record or background? She responded, "No, I don't." When I asked her why she was voting for him, she said, "I just am." -- Last week, I chatted with Shelley, a liberal pal who voted for Obama. I asked her what she thought of him now. She said that she thought he was doing fine, but she confessed that she wasn't following the news. That's the biggest problem -- not questioning the party line even though there are obvious gaps and gaffes. A big reason for this is fear. Many conservative women -- like the intrepid Sarah Palin -- are more capable, more powerful, yes, more a "man" than some of the liberal XY specimens. And the utter shame of this makes them despise you -- and want to render you helpless too. That's the universe I grew up in, that I lived in my whole life, until the mysterious winds of Fate swept me up and turned my life upside down. For most of my life, I was a secular ignoramus, living in and for the self. I navigated the world with the Braille of feelings; and I blindly followed the leaders. 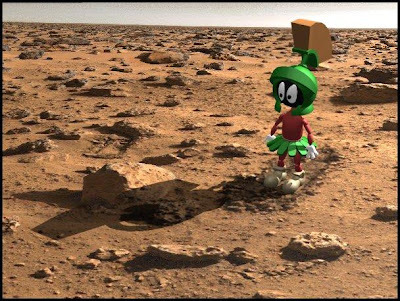 I've now spent 2 years exploring a different planet entirely, the more formidable and logical and spiritual one where conservatives work and play. I've parked myself firmly in your world, while I write about the other one. Frankly, I like your hemisphere better, and have settled in for good. I feel more safely ensconced with the earth beneath me and the heavens above me than I ever did in Outer Space. Gonna get a little spiritual on you this morning, but it's fitting seeing as tomorrow is the National Day of Prayer. It always cracks me up how people think that Palin's a religious nut. Ronald Reagan said far more "radical" religious things than Palin has ever said. I saw a comment on an old ADN article the other day back from when Sarah became Governor. It basically said that Alaska should get ready, because she was going to turn it into some kind of Christian gulag or something. See? The fear that runs rampant in liberals holes like the Huffington Post these days isn't new. History repeats itself. By the way, last time I checked, Alaska is still one of the most irreligious states in the country. So much for that whole, "Sarah Palin's going to force us all to convert!" thing. On page eleven of Going Rogue Sarah continues with her account of the character and times of her forebears. Her grandpa "CJ" is a particularly fascinating figure to me because, as we learn elsewhere from Sarah, he had a love for the Latin language! However, I would like to cite here what she says about her grandmother, Helen. "My grandmother Helen studied at the University of Idaho, then put her talent and intelligence to work as a homemaker, raising six active kids while working for the Red Cross...She worked tirelessly. My aunts tell me she was the hardest-working housewife they ever knew; they'd come home from school to see Grandma's bloody knuckles from her reupholstering projects...She laid the foundation for volunteerism in the family." What a beautiful testimony to a great testament!!! What was it that our Sarah said to Chris Wallace on Super Sunday back in February, when he asked her, during his Fox News Sunday interview, what she most wanted to do for her country? As I recall, she said that first and foremost she wanted to be a good mom, and to raise happy, responsible, independent kids. This is a legacy and troth and trust passed on through the generations that is more lasting and firm and enduring than any legacy of gold and silver!!! "Gold and silver," that is, money, has a certain fecundity (though Aristotle begged to differ! ); money begets money; wealth begets wealth. There is nothing wrong with a just return on one's money. We are not obama "redistribute-the-wealth" socialists here!! However, I do wonder if an even more lasting legacy was planted and set in place by Sarah's ancestors. Let us ponder for a moment those long, long years of Grandma Helen's labors in the quiet obscurity of the citadel of a home. Let us think of the hidden, but precious to the All-Seeing Lord, labors of Sarah's other ancestors. Just as cat begets cat, dog begets dog, lion begets lion, and yes, dollar begets dollar, so, I believe, the obscure, hidden, silent suffering and labors of Helen, of Helen's own forebears, of Sarah's own mom, have, at length, brought forth...what...what...? A lady marked by Heaven to be not only mom to her own kids, but Mother of Her Country. Ah, how, I suppose, any haters on the Left who may see this will mock it and rail at it and ridicule it. However, I don't give a DAMN!!! I only want to know if this is not perhaps the truth. I think it is. There is something in Sarah's great heart, her mom's heart, that has prepared her, descending as she does from a long line of undaunted keepers of the flame of the home, to play a role parallel to that of George Washington, Father of His Country. And here at length is the final rebuttal to the hypocrisy of some on the Left who, suddenly conceiving a concern for "family values," would bleat out, "No, no, Sarah cannot be President; she has to be at home with her kids." Yeah, right, like they care!! No, no, Sarah, I believe, has a special calling to be POTUS and mother of her country, and will best serve her own kids, and all the children of our great land, by assuming a mantle that only she can bear, because the Lord Himself, in conjunction with and in cooperation with generations of her ancestors, has woven it thread by patient thread for her, all through the lonely, dusty path of these long years. Now, at length, He is revealing it, and is preparing to place it on her strong Alaskan shoulders, in these fateful days through which we are living. Invincible and perfect and eternal are the words and works of the Lord!! I had someone ask me recently, "So, why do you support Sarah Palin?" If you want a quick list answer, see the end of this post. If you want the back story, here goes. It began with a gut feeling. During Bush's eight years in office, I was in high school and college. I've always been a bit of a political junkie, but I was far too caught up in my schoolwork to pay very close attention to what was going on. One semester I took a course in Public Relations. I believe this was in 2007. I first learned of Governor Palin back in April of 2008 when Trig was born. At the time I was working at our Student Radio station doing political news, mostly covering the primary contests. Trolling the Internet, I found a headline about the Governor of Alaska giving birth to her fifth child. Well, that's not something that happens every day, so I clicked on it. It was just a short blurb about how Alaska's first female governor's fifth child had just been born with Down Syndrome. I read the statement that she put out and was blown away. It was the sincerity of it that struck me. I don't think I'd ever heard a politician speak from the heart like that, except maybe Ronald Reagan. It made an impact. I was touched. I remember blabbing the story to my friends at dinner that night: "Guys, there's this woman Governor of Alaska who just had her fifth kid and he was born with Down Syndrome. She put out this really cool statement about how they were blessed...."
Then I mostly forgot about the whole thing. That is, until August, when I got another gut feeling. I turned the channel away from a movie I was watching to our local noon newscast. All I had to see was the ticker on the bottom of the screen: "John McCain picks Alaska Governor Sarah Palin as his running mate...."
I got excited about the campaign for the first time. As she delivered her speech, all I could think was, "That is the first female President of the United States. There she is. Right there." About halfway through the campaign, my gut instinct about her began to clash with the media picture that was being painted. Eventually, I didn't know which one to believe. I wasn't going to spend my time supporting someone that wasn't worth supporting, so I decided to ignore the campaign and do a little research. What I found on her positions and her record confirmed for me that I was most definitely not wasting my time. Star power + conservative principles + common sense + bipartisanship (yes, bipartisanship; she has a record of working across party lines) + an understanding and respect for Constitutional limitations on government + a drive and a record of being able to get things done = a woman I want in the White House. She also has what most other politicians would kill for: great instinct. She's positively Clintonesque in that regard. When she hit the national stage, she was inexperienced with national campaign media. Hiccups were inevitable. But no one can tell me that this woman is stupid. She didn't get from PTA mom to Governor on a fluke. But I can't be too hard on the media for making it a Palin vs. Obama scenario. This story won't be over until they go head to head and one comes out the winner. "Well, sometimes she trips over a sentence or mispronounces a word." And? So does every other human being who walks the face of the earth, including our sitting President. 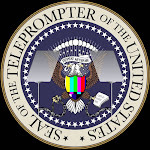 When a Republican President sits in the Oval Office (or a person exists who could be the next Republican President) the media seems to take great delight in assembling what can only be called a Gag Reel. With Bush it included things like him trying to go out a locked door and mispronouncing "nuclear." They whipped it out every chance they got to fit their "Bush is stupid" narrative. Now, don't get me wrong, Bush wasn't exactly my cup of tea. He was no conservative. I was never under the impression that he was anything more than a moderate. Now, I could whip up a pretty sweet Gag Reel of Obama too. And I guarantee you that if the media were biased against Obama like they are biased against Palin, you would think he was a complete dunderhead. Just because you become a politician doesn't mean you become perfect. Everyone is going to make gaffes, that's not the point. The point is that the media will gain back some modicum of credibility when they stop calling Palin an idiot because of her missteps while at the same time giving Biden a pass after he claims he's having dinner at a place that's been closed for years. If Palin had said half the things Biden or Obama said she would have been thrown off the ticket. 57 states, plus 1 more to go? Oy, it would have been all over. But Obama said it, and he was "just tired." When the campaign was over, it was depressing to sit and watch Obama "change" the country, so I started googling Palin to bring some hope for the future to my political world. That's how I found C4P. Together we Palinites watched the play-by-play of the ethics complaints and the media distortions and the legislative session. We watched as liberal anklebiters slowly wrapped legal chains around the Palin administration, to the point where she couldn't get anything done. We vowed to help her in any way we could, mostly by providing the accurate information the media refused to offer. Other than a few conservative talk show hosts, no big names were coming to her aid, so we, the "ordinary barbarians" of the world were going to have to do it. Because this woman was worth defending. There was a sense of a line being drawn in the sand. Liberals had destroyed people they perceived as threats before (see Clarence Thomas), but the attacks on Palin were beyond the pale. It became personal. It was a feeling of, "Not this woman. Not this time. You want her? You come through us." Our motto: "We've got your back, Gov." We are a motley crew. Most of us are far from professional. We just do all that we can, believing that it doesn't take a title to make a difference. One of the things that I enjoy most is the diversity of Palin supporters. Over at C4P (probably the most popular Palin site where a lot of us side bloggers got our start), you will find almost all kinds: young, old, black, white, Hispanic, Chinese, European, Australian, religious, atheist, pagan, former Democrats, Republicans, Hillary supporters, Independents, etc... We all have one thing in common: We love Sarah Palin. Tammy Bruce is a gay, pro-choice feminist. I'm not sure if you can find anyone anywhere who supports the idea of President Palin more than she does. Just a few of her opinions on the subject are here, here, and here. Hillbuzz is a site run by gay men who supported Hillary in 2008. Good luck finding more articulate and ardent supporters of Sarah Palin now. Some of their best writings on the subject are here, here, and here. One big hang-up for some is that she resigned from the governorship. Do I have a problem with it? No. The government of Alaska wasn't built to handle what Sarah Palin got herself into. She became a national threat and the state was getting pummeled as a result. She tried everything to make it work, but the fact that the legislature refused to fix the abuse of the ethics complaint process made it impossible to govern. When the pundits finally shut up and just aired her resignation announcement, I realized that this was far from over. She wasn't quitting the fight; she was moving it to a bigger battlefield. For now she's going around the country supporting certain candidates, and, yes, amassing some personal wealth. Got a problem with that? After almost facing bankruptcy thanks to her political opponents, there's no way she's going to let a lack of funds be used against her again. Now she can fight back. I wrote briefly earlier about the situation in Alaska that prompted her to resign. I won't repeat it here. But I will reiterate one point - the "half-term Governor" thing. First of all, technically she's a two-thirds Governor, thank you very much. Secondly, I would like to point out that while you may wish to beat Palin over the head for leaving her office, you cannot logically make the argument that she "broke her promise to Alaskans." Guess what? If she had been elected Vice-President she would have been a "half-term Governor" who "broke her promise to Alaskans" as well. Janet Napolitano did the same thing. Barack Obama didn't serve out his full Senate term. What's your point? Obama was a half-term Senator who didn't accomplish anything of any note other than make ridiculous promises like saying he would lower the sea levels. I'll pit my half-term Governor against your half-term Senator any day. "But Obama went to Harvard, he's so smart." If Harvard teaches you to pronounce it "corpseman" and that the US has 58 states, I'd say Harvard is overrated. "But Palin's so polarizing!" Why? Because she offers her opinions? Half of the country, if not more, disagrees with what Obama is doing. How come he's not "polarizing"? Obama calls his opponents "tea-baggers," and he's not polarizing? Obama says that the "police acted stupidly," and he's not polarizing? Because I believe her to be a woman of good character who genuinely loves this country. Because she believes in Constitutional restraints, and in being a servant of the people, not their master. Because she has a record of common sense conservative pragmatism, despite how much the media tries to paint her as a right-wing extremist. Because she acknowledges her need to rely on God for strength. Because her very presence seems to highlight professional politicians who long ago forgot that they were in office to serve others, not themselves. Because I see so many others in the GOP cutting and running on things like the Arizona immigration bill and offshore drilling, while Sarah Palin stiffens her spine. Because she's a natural-born leader. Because every time you think she's down for good, she comes back smiling. Because she supports Israel. Period. Because she drives the Left absolutely crazy. It's just funny to watch them completely lose their minds whenever someone says her name. Because when the media lies this much about one person, they're telling you who they fear. Because Mitt Romney is poised to become the new elder in the Republican Party, and if that happens, we're screwed. Because she's the only one who has a shot at beating Barack Obama. Because she never bows except to pray. Because I have seen the strength of her daughter under the microscope of a judgmental and at times mocking world, and I know she has to get that strength from somewhere. Because my half-term Governor can beat your half-term Senator. Because Todd would make the most awesome First Spouse ever! Because when I see little Trig smile, it warms my heart, and I want to see him smiling on the White House lawn someday. "What if she turns out to be a phony?" What if she does? Worst case scenario, we find out she's just another politician. In that case, I guess we go back to the fields until the next time a Cincinattus is required. No harm, no foul. But she's not a phony. I'd bank on it. The Palins attended the Time 100 Gala in New York last night. The NY Post has a short write-up of the event here. You can view photos of the event here and here. And here are some pics of the Palins running around the city before the Gala. All in all, looks like it was just a good time. Time for you to go.....to Alaska! As you probably know, Lefties with nothing better to do than harrass people have taken it upon themselves to circulate an online petition in the hopes of getting Discovery to drop the Sarah Palin's Alaska series. Don't you just love how tolerant they are of everyone's opinions? Considering the fact that the petition itself just demonstrates to Discovery that people are interested and will therefore most likely watch the series, I doubt highly that it will have any impact. Not to mention that Discovery has most likely already sunk money into it. However, it is important that both sides of the aisle be heard. Discovery should also hear from those who support this project. Therefore, I am asking you to sign this petition. Do it as a way of thanking Discovery for picking up the series and to demonstrate to them that you support it and will watch it. It is important that we fight back against the Gestapos who would try to tell Sarah to sit down and shut up. It's free and easy. It'll take you 20 seconds, tops. Just scroll down and enter your name and e-mail. You can choose to not show your name online if you wish. 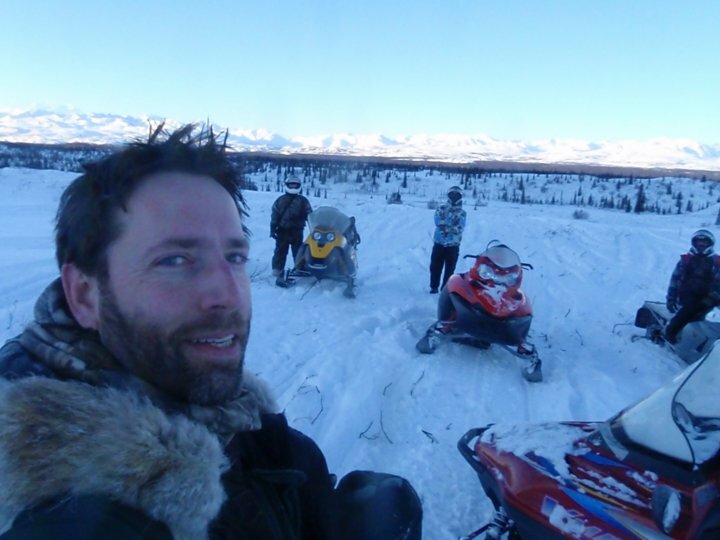 Fairbanks attorney running against Alaska Republican Sen. Lisa Murkowski this year is trying to drum up support for his campaign, meeting with conservatives in Washington, D.C., and advertising a "big announcement" that Todd Palin will be at his fundraiser in Wasilla this week. Miller said he'd work to repeal the health care law and Murkowski wouldn't. Murkowski told KTUU-TV a month ago that the law needs to be changed but "if you just repeal and you do nothing, we will not have addressed health care reform." Miller is also critical of Murkowski's 2008 vote in favor of the Bush administration's Wall Street bailout proposal. Murkowski said at the time that she had reservations about the plan, but felt it was needed to avoid a sharper economic downturn. Miller described Todd Palin as a friend who stands for many of the same principles that he does. Sarah Palin's political action committee donated $5,000 to Murkowski's campaign last June. But Murkowski subsequently criticized the use of the term "death panels" popularized by Palin during the health care debate, saying it wasn't accurate. Murkowski also was critical of Palin's decision to resign from the governor's office last July, saying that she was "deeply disappointed that the governor has decided to abandon the state and her constituents before her term has concluded." "Joe Miller isn't afraid to shake things up in order to get the job done, and that's exactly what we need in Washington today. 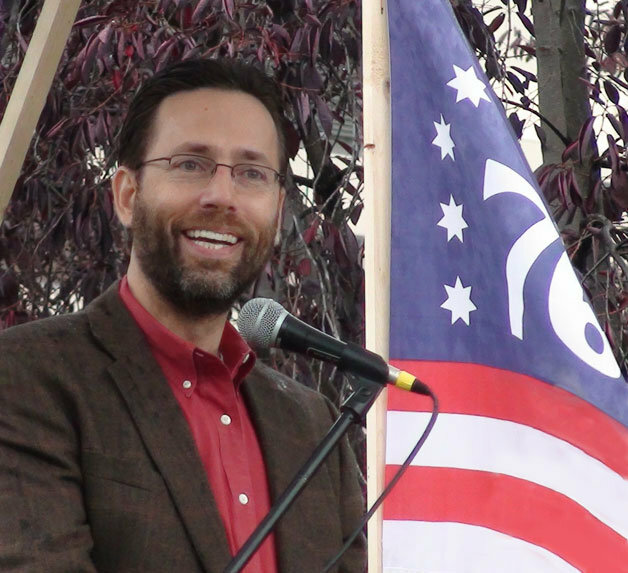 We need reliable conservatives who have the backbone to fight for fiscal reforms, and will protect Alaska's freedoms and opportunities with a passion that matches the size of our great state." "Todd's a longtime friend," Miller said. "He stands for many of the same principles." Miller takes issues with Murkowski's positions and voting record, which he says promote big government and an unsustainable national debt load that will be a burden on generations to come. "This is about a U.S. Senate seat," he said. "It's not about Sarah Palin and Lisa Murkowski." What the media will make of the situation, Miller said, is beyond his control. I don't think Todd Palin ever independently endorsed anyone else. Maybe he has, but not that I am aware of. Joe's also on Facebook and Twitter. Here are pics of Joe at a McCain rally in 2008. Beating Lisa Murkowski won't be easy. Good luck, Joe! Benyamin Korn of Jews for Sarah has an opinion piece in the NY Sun. When Governor Sarah Palin spoke to 16,000 Christian evangelical women in Louisville, Kentucky on April 16, guess which book she mentioned as the one she reads to her daughter at bedtime? Try the biblical Book of Esther. That’s right — Sarah Palin, mocked and pilloried by Jewish liberals as a danger to world Jewry because of her Christian beliefs, reads to her 8 year-old from a book that most Jews should probably spend a little more time with. Governor Palin’s Kentucky speech, to a group known as the Women of Joy, is being claimed by her critics as proof that she is too Christian. But a careful look at the speech reveals, in fact, how close to Judaism and the Jewish people she is. To judge by some accounts in the major news media, it sounds like she made a Bible-thumpin’, foot-stompin’ appeal to the unwashed fundamentalist masses. Ironically, the DailyKos.com columnist “Angry Mouse" quoted Governor Palin more accurately than did the Post or ABC News. She cited several examples of recent overreaching by those who want America to be more secular. She mentioned a Wisconsin judge’s assertion that National Prayer Day is unconstitutional, and she referred to President Obama’s statement that America is not a Christian nation. What? Poking Israel in the eye? What’s that doing in the middle of that remark? And how was it omitted from the Washington Post account? The Israel remark is there because to Sarah Palin, the well being of Israel and the Jewish people is an integral part of her worldview. Israel is not just another cold run-of-the-mill foreign policy matter, like trade with Mexico or aid to Sri Lanka. What happens to Israel matters to her as a Christian. Threats to America’s moral fiber and threats to Israel’s national security are all part of the same challenge that she wants Americans to address. Governor Palin takes her Bible seriously. Not in the sense of someone who wants to impose her beliefs on anyone else, but simply as someone who believes that both the Hebrew Bible an the New Testament provide moral guideposts for our lives. She reads the Book of Esther to Piper because she wants her daughters to emulate Jewish history’s most famous heroine. Fear-mongers with political agendas want to drive a wedge between Governor Palin and American Jewry. Sometimes they do it with quotations that leave out key sentences. Sometimes they do it with distorted depictions of her religious beliefs. Jews have nothing to fear from Sarah’s Palin religion. But we have plenty to fear from those political leaders who not only have no interest in Esther or Proverbs, or Sarah, but who think that poking Israel in the eye makes for good foreign policy. 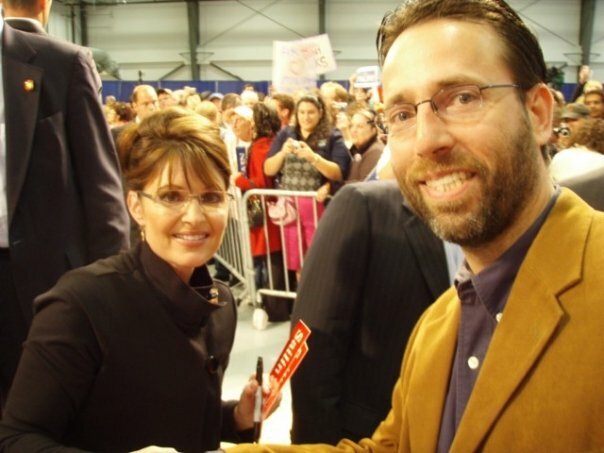 Mr. Korn, formerly executive editor of the Jewish Exponent at Philadelphia, is director of Jewish Americans for Sarah Palin, and editor of JewsForSarah.com. The Gulf of Mexico oil spill is a good test for the spines of today’s Republican Party. One Republican has already passed the test, and as usual, that’s Sarah Palin. The signs from the others are not encouraging. A day after pundit Charles Krauthammer declared “drill, baby, drill” to be history in light of the spill, and two days after the Obama Administration halted all domestic drilling (gee, what a surprise), Palin came out and invoked her moral authority as an Alaskan who lived through the Exxon Valdez spill. Yes, Palin says, the spill is horrible, as was the Exxon Valdez, which was why she took steps as a regulator in Alaska to put tighter controls on the oil companies. But she still comes to the same conclusion she’s touted before: We need domestic drilling. No matter how horrible the British Petroleum spill proves to be, it won’t change the economic reality. We are putting our economy and our national security at risk when we rely on the likes of Venezuela and Saudi Arabia to get the oil we need. And it is insane to do this when we can and should drill for oil on our own lands and in waters we control. This drilling can be done safely and cleanly. It obviously wasn’t in the case of the BP explosion, but it can and it should. It appears your average Republican luminary doesn’t want to touch this for the same reason Republicans usually lose their nerve. They figure anyone who stands up and endorses domestic drilling now will get absolutely murdered by the Democrats and the media. They figure all the election momentum is going their way right now – and indeed it is – and it makes no sense to risk it by making a controversial statement about domestic drilling in the aftermath of a horrible spill. This does not bode well for the prospects of governance under Republican leadership. Indeed, it sounds a lot like the last time they were in charge. If Republicans won’t say and do the things that need to be said and done whenever a) it would jeopardize an advantageous political position; or b) the media would beat up on them for it; or c) both; then the Republicans can’t do the things the country needs them to do. We need more domestic drilling, including off-shore, but when the GOP was in charge, they didn’t make it happen. We needed market-oriented health care reform, but it was easier for the GOP to do little or nothing on the issue, so they left the door open for Democrats to create a socialist behemoth the first chance they got. 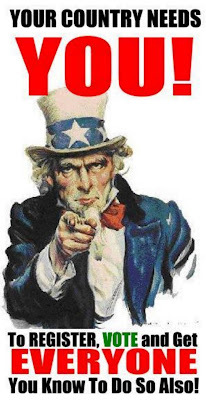 We need to get federal spending and entitlements under control, but that’s too hard because the media and the Democrats will say you hate Grandma. So the GOP did nothing. 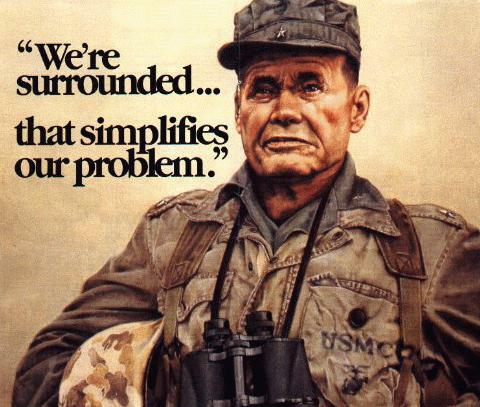 Real leadership is what you do when it’s right but it’s also hard. McConnell, Boehner and company have never been known for this, and now we have the latest example as to why. And if you don’t understand why so many people adore Sarah Palin, here’s Exhibit A. Many people understand we need to drill, baby, drill, but right now it takes courage to say so. While most Republicans run for the tall grass, Palin speaks the truth. It’s hard not to respect that, or her, and by the same to token, it’s hard these days to respect just about anyone else – Paul Ryan excepted – in the Republican Party.